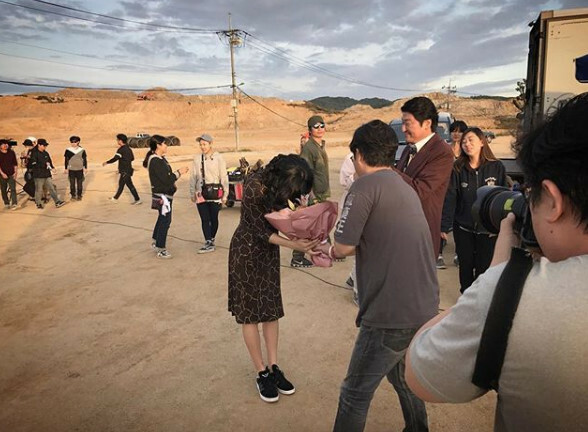 Filming of the much-anticipated crime flick “Drug King” featuring Bae Doo-na, Song Kang-ho and Jo Jung-suk has wrapped up, according to an Instagram post by Bae on Saturday. Bae uploaded a photo of herself receiving a bouquet of flowers from a member of the filming crew. “That’s a wrap,” Bae captioned the photo. Actor Song is also seen clapping in the picture. The film set in 1970s Korea traces the story of the infamous drug kingpin Lee Doo-sam, who was a major distributor of drugs and a dangerous boss of a gang. The film directed by Woo Min-ho -- who was behind “Inside Men” (2015) -- will open in theaters next year.